<Below text courtesy Tina Garnet> The Phoenix can be found in many different cultures. In Egyptian mythology, it is a legendary bird said to live in Arabia. The Egyptians call it Bennu, the Greeks Phoenix, the Chinese Fèng Huáng, and the Japanese Hō-ō. The Egyptians were the first to speak of Bennu, which later became the Phoenix in Greek legends. 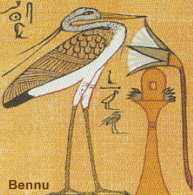 Bennu is mostly depicted as a heron, with a long straight back, a head adorned with two erect feathers, and its plumage red and golden. It was the sacred bird of Heliopolis, city of the Sun, where it stayed on the ben-ben stone or obelisk, inside the town's sanctuary. Its true home was however the Arabian desert; it only came back to Heliopolis to die and be reborn. Bennu was associated with the Sun God Ra and with Osiris, God of the Underworld, who is said to have given the secret of eternal life to Bennu. Bennu symbolises rebirth, as it rises from its ashes like a new sun rises when the old has died. It also symbolizes a new period of wealth and fertility, when the Nile flooded the earth each year. It is said that Bennu had created itself from the fire that burned on the top of the sacred Persea tree in Heliopolis. Another story says that the heron Bennu was the first life form to have appeared on the mound which rose from the watery chaos of the first creation, which links Bennu to the Nile and its periodical floods. The mound was called the ben-ben, and was the origin of the town of Heliopolis. Bennu is, one way or the other, the personification of creation and life-force. After 500 years, according to Herodotus, Bennu flew to the Sun temple in Heliopolis to build its funeral pyre with incense twigs. It then climbed onto it and waited for the sun's rays to consume it, singing a song of rare beauty as it did so. According to Pliny, from the ashes emerged a small worm that the sun's rays turned into a new Bennu at the end of the day. It is also said that a new Phoenix rose immediately from the ashes and flew with it's predecessor's embalmed remains to Heliopolis, accompanied by a flight of turtledoves. In Greek and Roman legends, the Phoenix is the symbol of immortality and resurrection. It is associated with the Sun god Phoebus [Apollo]. Its name "Phoenix" is the Greek word for "red," which links this magical bird to fire and the sun. It is said to resemble an eagle or a peacock. The Greek believed that the Phoenix lived in Arabia, in a cool well. At dawn, each morning, it sung a beautiful song, so beautiful that the Sun god would stop his chariot to listen. The Phoenix is a unique bird, there may only exist one at a time, which makes it a solitary bird. It does not reproduce, which adds to its loneliness, as only its death will bring on another of its race. When it feels its end approaching, it builds a nest with the finest aromatic woods, sets it on fire, and is consumed by the flames. From the pile of ashes, a new Phoenix arises, young and powerful. It then embalms the ashes of its predecessor in an egg of myrrh, and flies to the city of the Sun, Heliopolis, where it deposits the egg on the altar of the Sun God.